This is the most popular type of Japanese green tea. The tea has a light and grassy taste as well as a pleasant fragrance of young spring leaves. This roasted green tea is very popular in Japan, and increasingly so in the U.S. This tea has roasty, nutty flavor with less caffeine. Matcha is finely ground green tea powder, used for Japanese tea ceremony. It has clean, verdant flavor and vivid green color. This special tea has an intense green color and a strong taste. A mix of green tea, roasted genmai (brown rice) and matcha. Genmaicha is a casual tea that can be used for any occasion. 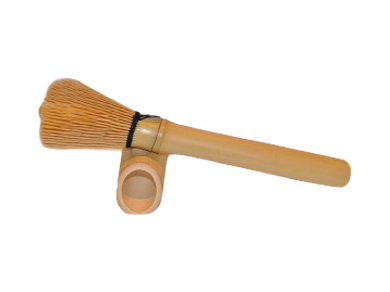 This six inch long bamboo chasen (matcha whisk) is for everyday use. Categories: tea accessory, Matcha. Tags: bamboo, bamboo whisk, casual, casual chasen, chasen, everyday use, matcha, matcha making, matcha making utensil, matcha whisk, mini chasen, organic matcha. Any order over $50 qualifies for free standard shipping in the continental U.S. Shipping rate for orders less than $49.99 is $8.00. Orders over $50 qualifies for free standard shipping. For orders less than $49.99, shipping rate is $11.00. Shipping to Canada is flat rate of $25.00 USD. Jugetsudo is not responsible for any customs fees that may be retroactively added to the shipping cost upon arrival. Orders placed before 9am PST Monday-Friday will ship within one business day. All orders are sent from our Portland, OR warehouse. Orders placed outside of business hours will be processed on the next business day. USPS - Most items will be shipped via USPS service; this is our default shipping method. Shipping rates are based on weight and destination. No expedited service. If you feel that you have not received what you expected, we offer the following return policy: All returned items must be unopened and in resalable condition. Except for cases of product defect, all return shipping charges will be paid by the customer. We will only accept returns or exchanges with receipt. Payments made via credit card can be credited back to the original card used. For returns on any items from an order that received free shipping, the original shipping savings associated with the returned item(s) will be deducted from the refund amount unless the return was due to our error. Please send email to info@jugetsudousa.com for the return instructions.